I have been wearing Ray-Ban Wayfarers since 1985. I watched Madonnai n Desperately Seeking Susan and that was it. We've been inseparable ever since. I've cheated on them a few times with Nicole Richie's House of Harlow, Burberry and Yves Saint Laurent but I always come back to my Ray-Bans. Black, large lens, tilt - they've become a huge part of my style and I feel a little naked without them. From Audrey Hepburnin Breakfast At Tiffany's to Tom Cruisei n Risky Business and then Top Gun, The Blue Brothers to Men in Black, Dylan to Jay Z - Ray-Ban are the most recognised iconic sunglasses in the world. They're celebrating over seven and a half decades of cool and have opened their archive image vault especially for us. 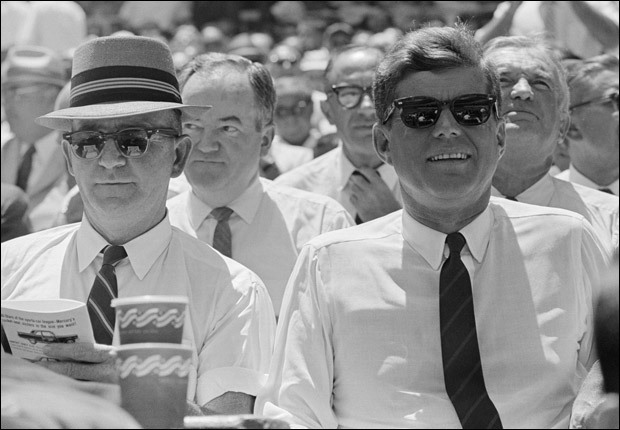 You know how much I love a retro shot...here, is the Ray-Ban story in pictures. Shots From The Ray-Ban Vault. Facts To Use At Dinner Parties. Knowledge is power; it’s also a party trick – use some of this sunglass trivia at your next dinner party. Ask your guests what their favourite moment was? Everyone has one. – In 1937 the first Ray-Ban sunglass was designed for pilots as technology was taking planes higher in to the atmosphere and pilots were developing migraines from the glare. – In 1938 Ray-Ban launched the Shooter with a “cigarette holder” on the nose bridge – a style that will be re-launched this Summer. – The 1950’s saw the launch of the Wayfarer which became an instant success with movies like Rebel Without a Cause. – During the 60’s and 70’s actors sported Ray-Bans, like Peter Fonda in Easy Rider, Clint Eastwood in Dirty Harry and singer Bob Dylan was rarely seen without his Wayfarers during the 70’s. – The 80’s saw interest from Hollywood grow with iconic movies: The Blues Brothers, Top Gun and Risky Business and it was also the decade that Michael Jackson rocked a pair.